35 minutes to Universal Studios & Hollywood. Newly renovated sites. Easy access pull thrus. Grass sitting area and fire pits. Store with groceries, beverages, pet supplies and RV supplies. Propane. We were passing through and stayed here one night during our travels and I was thrilled to get a same day (Saturday) reservation. The staff were very friendly and helpful and restrooms were modern and very clean. The sites were sub par but functional with a dirty piece of astro turf in place of grass. My main complaints are a rather large number of the long term residents refusing to follow posted rules about clutter and storage around their site and under their RV making the place look trashy. And teenagers or young adults that I assume live here or were visiting someone living here were cruising around in the early evening with their windows down and music blaring. If the posted rules were strictly enforced this wouldn't be too bad of a park, as it is we didn't feel completely comfortable outside alone after dark. I'm not sure I'd stay here again. We stayed here for a couple days on our way through Central California. The park has nice level sites with a table and fire ring. The pool is beautiful and there is a new play ground area if you are traveling with children. We felt very safe here and enjoyed the quiet relaxing feel of the park. The office staff was very friendly and helpful. We didn't use the restrooms but did go in to look at them. They look just as nice in person as the picture on this site shows. They are very clean and convenient to the overnight area. This is a pretty park just off the I-5 and very close to Castaic Lake. We would definitely stay here again when traveling through this area. I called on short notice as I made my way back to Northern California, and made a reservation for one night, calling earlier in the day to find a decent site. When I arrived, the staff at the registration office was very helpful, kind, friendly, and immediately invited me to a pizza party being held behind their office, around the very nice and large heated pool. When I mentioned a desire for a nice cold beer, the owner himself left to return a few moments later with a tall, cold glass to wash down the pizza offered when I first arrived. The pizza was great, and I met and talked with both, one of the owners, and the park GM, both of whom were friendly and welcoming. I found the park to be well equipped with wide sites, a concrete drive and pad, picnic table, and fire pit. Sites were angled such that one's view wasn't entirely impeded by one's neighbors on either side. As I walked through the park, I found the layout logical, with approximately 6-8 sites devoted to potential overflow, where latecomers could boondock, should their needs require a place to rest when no other full hookup sites were available. I would easily stay here again, and salute the owners for creating a fine, friendly park! I stayed here in 2016 for over 10 days. Instead of allowing me to renw.I had to physically disconnect and move to another site next to me. This happened again 2x in 2017. Nobody even came in to occupy the site I was in one time. Why not just have the new person go to the empty spot instead of me moving there? This really is a nice clean park BUT it is a true permanent resident place. There are about 10 sites for traveling RVers. Some of the permanent resident sites are a real eyesore with junk, plants, Man cave/tents etct. Not a real campground. More for locals who want an easier cheaper way to pay rent. My husband and I are shocked that this RV park has the ratings it has. 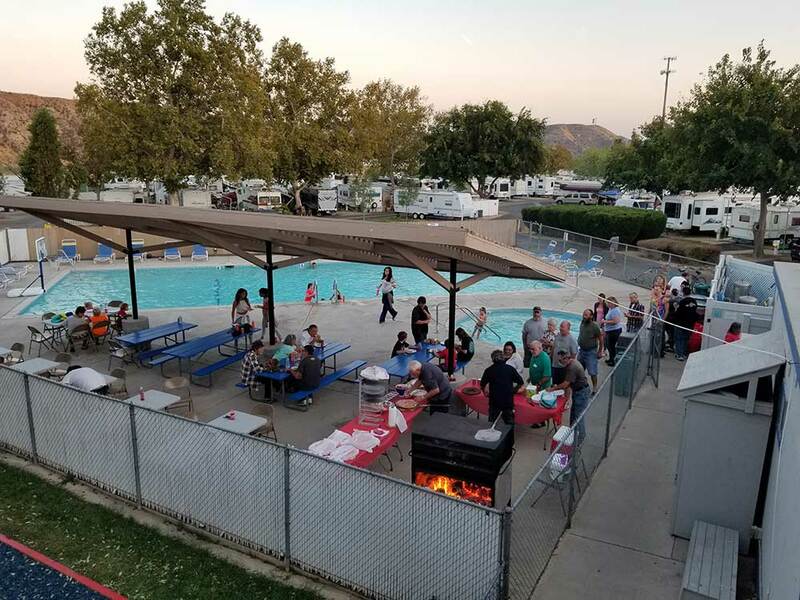 With the exception of clean bathrooms, laundry room and pool area, the rest of the place was filthy in places, overcrowded, with mostly full-time residents in varying degrees of run-down campers. The sites had rotting smelly artificial grass. The place was so crowded that we had difficulty getting out. There are trucks coming and going all day and night right outside the park. I would never recommend this park to anyone. A totally overrated RV park. Small cramped sites and the service roads where very narrow to maneuver our 40ft 5th wheel through. Lots of people living full time at site. I could not find grocery stores nearby and everything else was either fast food or someplace that looked like it would give you Montezuma's revenge. I am astounded at the high ratings of this campground. We called to make a reservation and they said they only had room in the overflow area - once we got there and they took us to the site, I was disgusted. There were campers all around that looked like they had been abandoned and it was like a junkyard. We said no to that and then the owner, who was great, asked why we were out in overflow and gave us a pull through site which was much better for the same price but I still did not like the park and although we paid for 2 nights, left the next morning. The bathrooms are super clean as is the pool area but it just felt wrong and junky around the campsite. Also very noisy as the town has a lot of trucks coming through. I would not recommend this place. The best RV site we visited in a three week tour of California. The pull-thru site we had was easy to access and plenty of room for the car we had with us. The staff are outstandingly friendly and the facilities are terrific. The pool is the largest we used and was clean and a spa tub that was to die for. We used both of these facilities at about 9.30 p.m. and had them to ourselves - bliss. The showers were lovely and clean and very spacious, We didn't have cause to use the laundry facilities as we only stayed one night before returning home but I wished we could have stayed longer. The area is very nice and the site was quiet (despite being quite full) and relaxing. I would highly recommend this site.